Home / Tips and Info / Everyday Life / “Good Fortune” is Revealed! I hope 2019 is getting off to a good start for you and your loved ones! It is so hard to believe that time is marching by this quickly! I remember when 2007 sounded so far off. 2019!!! This week not only was the beginning of the New Year, but the reveal of Bonnie Hunter’s Mystery Quilt “Good Fortune”. This is the first of her mysteries I have participated in. I have thought about participating. I have even downloaded the PDFs, but I have never actually done one. Part of the reason why I have not is because of the time of the year. Another big part was the fact that I was going to put that time into making a quilt that I had no idea whether or not I would like. I admire Bonnie’s quilts. I look through her website, and like 95% of them, but who knows about this one? But. hey, scraps are accumulating and they have to go somewhere, right? Well, I am super glad I did! This quilt is going to be gorgeous! And I have learned so much from her hints that I had not heard before, even though I have quilted for many years. Next time I will be more adventurous (yes, I said next time!) and stray a bit from Bonnie’s color palette. If the color values remain the same, and the colors look good together, it should work. 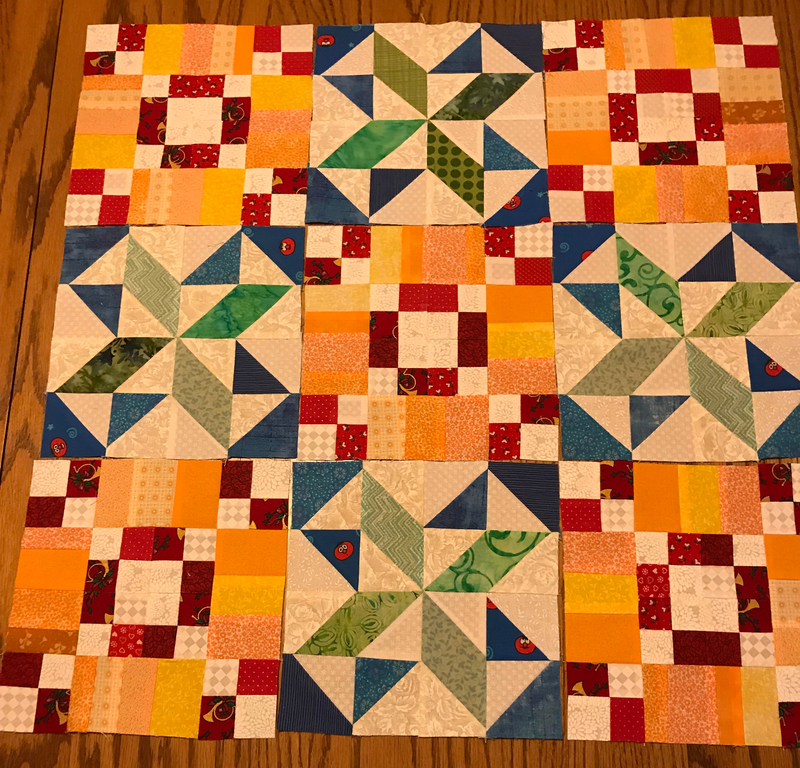 I love what she picked, in spite of all the orange, but I would make it mine next time, and change the colors up, keeping in mind what color scraps I have in excess. I had never heard about keeping the ruler line on the fabric and not on the cutting mat. Just that extra “scant” when cutting makes a really big difference. I learned that there IS a use for the strips of Christmas paper that you have left after wrapping gifts! I used these for the foundation paper for the neutral rectangles. I am still in amazement at all the planning that Bonnie Hunter has put into these. I am not a pattern follower. I love to put my own blocks together, and design them myself. But I cannot fathom putting all of this together, right down to the direction to press every piece and have it all come out properly. I have never done anything this intricate with this many pieces. I learned to trust the authority, and blindly follow. GULP! I had no choice if I was going to do this. I had no idea what the final goal was, other than a quilt. (I like plans, and l like to work the plan!) It was obvious I was working a plan, but I had no idea where that plan was going to lead. Lots of good life lessons in that one! Last but not least, I learned to slow down and enjoy the process. I am a get it done person, who has trouble sitting still. But when you know that you won’t know for a few days what the next step is, it takes some of the fire out of the “get it done”. Why rush when you are going to be able to move on anyway? My Helper, Lucy, supervised while I removed the paper foundations. Now I can’t wait to get the blocks together so that I can play with the beautiful borders! If you haven’t gone to the website and looked at this beauty, or better yet, downloaded the free instructions, I would encourage you to click here! The free instructions disappear the beginning of February. After that, they will be incorporated into a pattern or book. Previous post: Haste Makes Waste!